For 18 years StandUpGirl.com has been on the cutting edge of the pregnancy help movement offering a community of support and referrals to local resources for young women right where they are at, the internet. While our mission is not unique our approach certainly is. Discovering and innovating new ways, through technology, to reach young women with a life-affirming message is a part of our DNA at StandUpGirl.com. Our approach has been blessed with great success, we reach about 4 million people each year with this life-saving message of hope and courage. However, we know that there are always more young lives to be reached and babies saved, which is why this year we launched our newest initiative, “Be the Difference. . . . Save a Life”. The “Be the Difference. . . . Save a Life” initiative was born out of a desire to empower youth with the tools and resources needed to share a life-affirming message with their peers and in their social groups. We are striving to engage youth in a peer to peer support relationship by offering the resources available at StandUpGirl.com. Resources such as pregnancy support, abstinence information and a community of followers helping each other in a time of need. Our goal is to equip every young person with the necessary tools, so they know where to turn when they, or their friends, face a crisis. 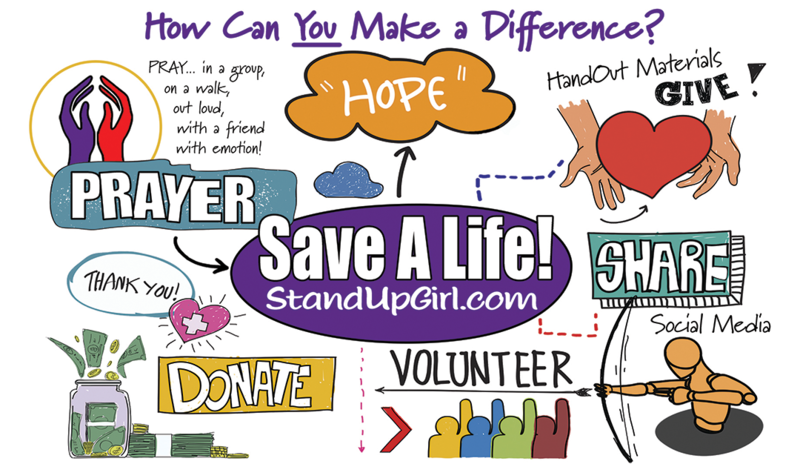 We have begun creating and fostering relationships with youth organizations, schools, and churches all over the country to make our special “Be the Difference” materials available to them and to educate them on what resources we have available at StandUpGirl.com. Through StandUpGirl.com’s longtime partnership with Option Line and Heartbeat International we are also making these materials available to Pregnancy Help Centers all over the world, free of charge. And this is just the beginning! We have received tremendously positive feedback so far; young people are drawn to the positive nature of the message and the opportunity to be involved in a social cause. Our materials have been flying off the shelves, so to speak, and our events calendar is quickly filling up with opportunities to share our message to new audiences. We know from experience that lives are being saved and families transformed through the miraculous, life-affirming ministry of StandUpGirl.com. This new frontier for our ministry brings excitement and endless possibilities, but we couldn’t do it without our dedicated team of volunteers, supporters, and donors who make our work possible. If you would like to learn more or join with is in this endeavor, please call 503-304-1531 or email director@standupgirl.com to find out how you can help. Please also visit www.standupgirlfoundation.org and join our email list to receive updates on our work and how you can be involved. Together we can make StandUpGirl.com a household name in pregnancy support.